Wow… I want to read this book. Here are a few quotes from a review in the Irish Times. My first time at this website though I do have some Irish ancestry… In this book, an aged Nobel Laureate and thoughtful critic mourns the state of our culture. He is not a Christian preacher, but according to the reviewer, his anger makes him sound like one at times. Is it possible for us to appreciate the speed of decay in our own generation? He suggests that while we may not be living in the worst of times, we are living in the stupidest…. “It’s not easy, however, to be orderly on such an all-encompassing and sensitive subject as the way we live now. On some aspects, such as the art business, Vargas Llosa practically foams at the mouth. The art world is “rotten to the core”, a world in which artists cynically contrive “cheap stunts”. Stars like Damien Hirst are purveyors of “con-tricks”, and their “boring, farcical and bleak” productions are aided by “half-witted critics”. “We have abandoned the former minority culture, which was truth-seeking, profound, quiet and subtle, in favour of mainstream or mass entertainment, which has to be accessible – and how brave if foolhardy of anyone these days to cast aspersions on accessibility – as well as sensation-loving and frivolous. “Value-free, this kind of culture is essentially valueless. 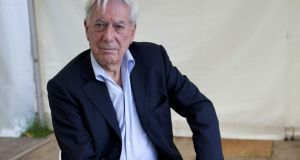 “Vargas Llosa adopts a name for this age of ours coined by the French Marxist theorist Guy Debord. We live in the Society of the Spectacle. A name that recalls the bread and circuses offered to a debased populace in the declining Roman empire. Exploited by the blind forces of rampant consumerism, we are reduced to being spectators of our own lives rather than actors in them. “Our sensibilities, indeed our very humanity, is blunted by those who traditionally saw their role as the guardians of it. “The intellectuals, the supine media, the political class have abandoned substance and discrimination and with treacherous enthusiasm adopted the idea of the image as truth. The liberal revolution of the 1960s, especially the events of 1968 in France, and French theorists such as Michel Foucault and Jean Baudrillard come in for a lot of invective. They have turned culture into “an obscurantist game for self-regarding academics and intellectuals who have turned their backs on society”.